McNary senior Kailey Doutt’s face lit up with excitement when asked about the Lady Celts cross country team, especially freshman teammate Ella Repp. Doutt won the girls varsity race at Joe Dancer Park in McMinnville on Wednesday, Sept. 13, finishing in just over 20 minutes and 12 seconds. Not far behind her was Repp in 20:30.47, good enough for third. Doutt ran alongside Maddie Rollins, a McMinnville senior who qualified for the state meet last season, for most of Wednesday’s race, before kicking into another gear in the last 400 meters to win by seven seconds. Doutt, who battled injuries during cross country and track last season, added she’s feeling better and stronger than ever. “I’m going faster in workouts that we’re doing than I ever have,” Doutt said. Repp’s 20:30.37 was the eighth fastest girls time ran this season in the Greater Valley Conference. The top 10 finishers at the district meet on Oct. 25 qualify for state. As a team, the Lady Celts (39) finished 15 points behind McMinnville (24), whose top five runners placed second and then fourth through seventh. McNary junior Emma Garland took eighth in 22:11.65. Senior Alison Repp and freshman Reyna Terrazas completed the scoring for the Lady Celts, finishing in 23:30.10 and 23:31.80, good enough for 14th and 15th respectively. With 67 points, McKay’s girls placed a distant third. 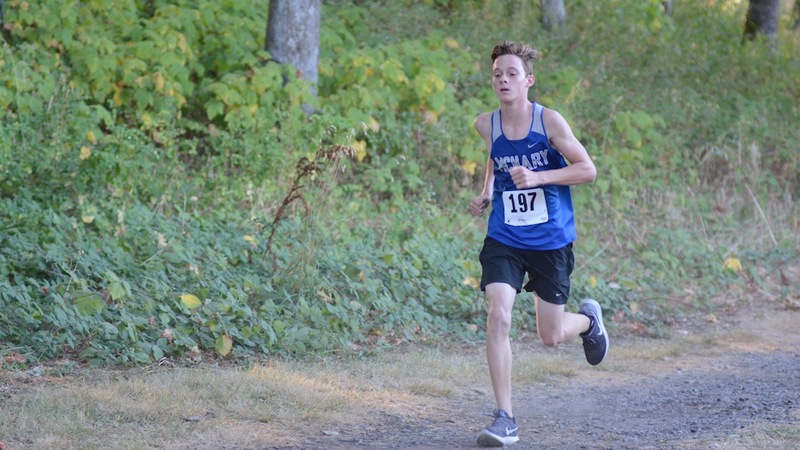 In the boys race, McNary junior David Allen showed just a glimpse of what he’s capable of. Running in his first ever 5K, Allen finished behind five McMinnville runners, to place sixth in 18:34.09. Allen played junior varsity football at McNary last fall but gave it up to try cross country. Since Allen’s favorite sport, baseball, is in the spring, Allen hadn’t even ran track before. He also barely ran this summer, recording less than 60 miles. “He’s (Allen) a guy as a coaching staff, when we talk about him, we smile and we laugh almost because he really doesn’t know what he’s doing,” said Holcomb, who coached Allen in football. Jonas Honeyman (10th, 18:59.49) and Ethan Whalen (11th, 19:06.28) were the second and third McNary boys to cross the finish line as the Celtics edged McKay 59-62 for second place. Noah Egli (19:47.64, 15th) and Emanuel Figueroa (19:54.88, 17th) completed the scoring. Holcomb noted the Celtics have around a dozen boys competing for a varsity spot. After not having enough girls for a junior varsity team last season, the Lady Celts won the JV race on Wednesday, edging McMinnville 29-34. Freshman Nina Garland placed first in 24:21.32. Duyen Barr (fourth, 25:34.31) and Jaizielle Samson (fifth, 25:42.04) finished inside the top five.